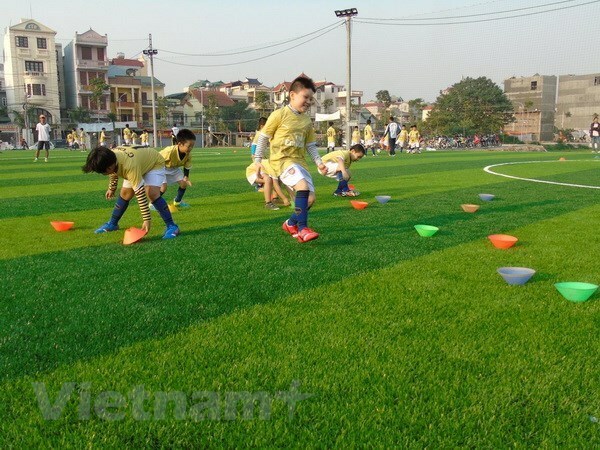 HCM City (VNA) – The National Fund for Vietnamese Children and the Phu Nhuan Jewellery company (PNJ) jointly launched a programme on April 2 to support autistic children in Vietnam, part of a project to raise awareness of autism in children in Vietnam. With a budget of 10 billion VND funded by the PNJ, the five-year programme is expected to directly benefit more than 10,000 families and 4,000 autistic children. The project’s activities include the issuance of a national document providing knowledge on autism, personnel training, communications to raise public awareness of autism, and the mobilisation of resources for supporting children with autism. At the launching ceremony, Cao Thi Ngoc Dung, Chairwoman of the PNJ’s board of directors, called on the community to join hands together to give children with autism the resources and access they need for a stable childhood. Meanwhile, Nguyen Thi Hien, Vice Director of the National Fund for Vietnamese Children, said that on April 8, the national document on supporting autistic children will be introduced. The document provides teachers, supporting technicians, staff, and parents with comprehensive knowledge of autism, its symptoms, and methods to address its behaviour patterns. In its next stages, the project will focus on enhancing the capacity of key officials in communications and assisting autistic children, and popularising knowledge amongst parents of autistic children, as well as teachers and officials involved in educating and protecting children. This standardisation of knowledge around autism in Vietnam will give the public a proper insight into autism and reduce discrimination against children with autism. By the end of 2018, Vietnam was home to over 200,000 children diagnosed with autism. Experts noted that the number of autistic children in Vietnam has increased rapidly, with the figure in 2007 already 50 times higher than that in 2000.